The Solstice Dashboard for Enterprise Edition is a centralized management tool that can be used to monitor, configure, and update Solstice Enterprise Edition Pods and Windows Software instances on a network. While each Solstice display can be configured individually via its local configuration panel, the Solstice Dashboard allows IT administrators to manage larger Solstice deployments from a central location. Note that while standard, non-Enterprise Edition Solstice displays appear in the Solstice Dashboard, they will need to be upgraded to Enterprise Edition licensing to be managed via the Solstice Dashboard. When upgrading Solstice displays to a new software version, Mersive highly recommends updating the Dashboard before updating displays or the Solstice Discovery Service (SDS). The Solstice Dashboard is available as a free download and runs on a Windows host on the same network as the Solstice Enterprise Edition Pods and/or Solstice Software instances it will be used to manage (or where the appropriate IP routes exists). The Windows host may be a Windows 7, 8, or 10 computer or a Windows Server 2008 R2 or 2012 R2 with qWAVE installed and a quad core processor with 12GB RAM minimum. A Windows 2016 Server may be used if desktop experience is enabled. The Solstice Dashboard should be installed on a Windows computer that the IT administrator uses regularly. It can also be installed on multiple PCs to manage the Solstice displays on the network from multiple locations. The image below depicts the Solstice Dashboard interface once displays have been added to the instances panel to be managed. The Dashboard is divided into two main panels. On the left-hand side is the instances panel, which is used to select one or more Solstice displays to manage. On the right is the Dashboard configuration panel where you can enable and change settings to fit your use case. Solstice Instances: Add or remove Solstice displays (Pods and/or Windows hosts) on the network to or from your Dashboard. Select one or more Solstice displays for configuration and management. Configuration: Change settings for appearance, usage, network setup, security, digital signage, scheduling, activity, and licensing for one or more displays. SDS: Solstice Discovery Service is free software that is separate from the Dashboard but resides on the same network to resolve IP addresses to display names, enabling display discovery and click-to-connect functionality for users. This component is accessed in the rightmost ‘SDS’ tab. To learn more about Solstice Discovery Service, refer to the SDS Guide. Kepler: Kepler is a free, cloud-based application available for Enterprise Edition licensed displays that provides metrics and intuitive analytics on your meetings and monitors the health of your Solstice deployment. You can use the Dashboard to create a Kepler account and onboard your Pods to begin collecting data and monitoring them in real-time. The instances panel located along the left side of the Dashboard provides a list of Solstice displays available to be managed. A Solstice instance is a single Solstice display on the network and may be a Pod or Solstice Windows Software. The figure below shows an instances panel that has been populated with several different instances. For each instance the machine name, an IP address, and the corresponding Solstice display name is shown. This allows the IT administrator to quickly associate each Solstice display name with the corresponding host machine and IP address. Note that the Dashboard separates all instances into groups based on Pod or Software instances, Small Group Edition (SGE) or Unlimited, Solstice software version numbers, and unsupported instances. Each group of instances has slightly different configuration options and thus each group must be managed separately. For example, the unsupported instances group supports only minimal functionality. So, if an admin wished to change a setting for all Solstice instances on the network, the admin would need to update each group separately. Important note: Unsupported Solstice instances need to be updated to Solstice Enterprise Edition licensing and a supported software version to be managed by the Dashboard. Alternatively, the Solstice Dashboard software may also need to be updated to support more recent Solstice Pod and Windows Software versions. For example, the 3.5 Dashboard is required to manage 3.5 Solstice instances. Mersive highly recommends updating the Dashboard before updating the instances. Discover:Select Solstice displays to import from a list of displays that are currently deployed on your network. This method is useful if you first install a set of Solstice instances on your network and then want to manage those displays once they are already running. The discovery list will include all displays that are either utilizing the Solstice broadcast discovery mechanism or are listed in the Solstice Discovery Service (see the SDS section of this guide for details). Once the file has been created, click the CSV File button, browse to that file on the Dashboard host PC, and load the Solstice instances list. If no port is supplied in the text file, then the default Solstice communications port (53100) is assumed and used. Manual: Import a new Solstice instance manually. The button will open a dialog box that allows you to type the display name, IP address, and communication port for a new instance. This is useful if you first want to create a set of instances for host PCs that do not yet have Solstice Software (server) installed, or if your Solstice deployment is not utilizing broadcast display discovery or SDS. Once a set of displays has been imported into the Solstice instances panel, their status is shown in the Dashboard. By selecting one or more instances, settings can be managed either on an individual or group basis. Use the common Shift+click and CTRL+click mechanisms to select multiple displays in the list. You can select and configure any number of Solstice instances that are in the same instance group simultaneously. The Solstice instances panel provides the admin with at-a-glance statuses of all displays being managed. Display status – indicated by a red, green, or blue status icon – is updated periodically by communicating with each display over the network to learn the display’s state. While each display is being updated, its status icon will temporarily be replaced with a “loading” icon. The number of users currently connected to the display is shown below the Meeple icon. Finally, the display name, IP address, and display host PC machine name are shown. The image below shows an overview of the five columns in the Solstice instance panel. By clicking on a column heading to use the sort feature, the list of Solstice instances can be sorted by any of the five columns, enabling administrators to view and manage the Solstice instances more efficiently. View this Display: Allows you to view the display live in a web browser using the browser look-in feature. The look-in feature must first be enabled for the display in the configuration panel (Appearance and Usage tab). Upgrade and Configure: A Pod-only option that opens the Pod’s web-based configuration panel via a web browser on the Dashboard host PC. Retry authorization for all displays: Triggers an immediate attempt for the Dashboard to establish network communication with all displays in the instance panel and will prompt you for passwords on any displays that are password protected. Remove selected displays from Dashboard Management: Removes the selected displays from the Dashboard’s instances panel. The display can be added back if needed using one of the import options. Export displays to file: Create a .csv file that shows the Display Name, IP Address, Port #, and unique Device ID for the selected instances or for all managed devices. This file may be used to import instances into the Dashboard in bulk. The action panel at the bottom of the Solstice instances panel can be used to control one or more selected Solstice Windows Software instances. These actions do not apply to Pods, though Pods are counted in the totals shown above the action bar. The total statuses above the action icons reflect all displays visible in the instances panel, so the administrator understands the number of displays and users that could potentially be impacted by taking an action. The image above depicts the action panel and its options. In this example, you can see at the top of the action panel that there are 14 displays total in the instances panel, 5 of which are active with 1 connected user, and 9 of which are unresponsive. Displays become unresponsive if the display host machine (Pod or host PC) is removed from the network, is powered off, or the Solstice Software (server) is uninstalled from a managed host PC. Activate Displays (Software-Only): By clicking this icon, Solstice Software will launch and run in the mode for which it is configured. Users can then connect and post to the Solstice display. Deactivate Displays (Software-Only):This stops the current Solstice session (if any), disconnects users, clears the display of posted media, and then closes the Solstice Software program on the Windows host PC. Disconnect All Users:Any connected users are disconnected from the selected displays. If the action impacts one or more users, a warning pop-up will appear. By continuing the action, connected users will be disconnected and all media posts will be deleted. Clear All Posts: All posts on the set of selected displays will be deleted. Users will remain connected and are free to continue using the Solstice display. When one or more displays are selected, the configuration panel interface will display the current settings for those displays and allow them to be modified. Note that the Dashboard configuration panel is very similar to the local configuration panel available from the Solstice Software interface and the local or web-based configuration panel of the Solstice Pod. The Dashboard configuration panel provides access to all the same control and management capabilities of the local and web configuration panels, however 1) the Dashboard provides expanded functionality such as discovery tags, quality of service configuration, digital signage, calendar integration, the Solstice message center, and much more, and 2) the Dashboard has centralized, one-to-many management, compared to the one-to-one management available from the local and web configuration panels. If multiple displays are selected in the Dashboard instances panel but their existing settings are different for a given configuration option, this will be shown as a dash (—) in the corresponding text fields and selection boxes. For example, if an administrator selects 10 displays that have different security modes set, both the Open and Screen Key checkboxes will be filled with a dash. By selecting multiple displays and then changing a setting for those displays, that setting will be applied to all displays at once. The Dashboard will remind you when changes have been made that need to be applied to the selected displays. Any section that has unapplied changes will highlight the tool icon corresponding to that section. This is useful when modifying several parameters at once to remind the administrator what changes have been made before they are applied. If you try to close the Dashboard with unapplied changes, you will be prompted to take one of these actions: Apply Changes, Discard Changes, or Cancel. The image below shows how the tool icon turns bright yellow, indicating that there are unapplied changes. There are eleven tabs across the top of the configuration section of the Dashboard: Appearance and Usage, Network, Security, System, Digital Signage, Calendar, Message Center, Kepler, Activity, Licensing, and SDS. As a note, the configuration and management options available for Enterprise Edition Solstice Pods and Solstice Windows Software instances differ slightly. Therefore, only instances in the same instance group can be selected simultaneously to apply changes (e.g. an admin can’t select both Pods and Software instances at the same time to apply changes). The following section details each tab available in the Dashboard and the available options. Allows the admin to set or update the name of an individual Solstice display. The display name is the primary identifier used for both the Dashboard admin and users of the display and is usually based on the room name, such as “Conference Room 3A” or “Front Huddle Space”. Allows complete customization of the screen that users see when they walk into a room, before any connections have been made. Every module (such as the display name or SSID information) may be shown or hidden individually, and a custom background image may be uploaded here. Pre-populated background colors/images for Solstice Windows Software instances are available here as well. Display Mode (Software Only): Allows you to set whether the display will be full screen (recommended), windowed, or a fixed size. Background (Software Only): Allows you to set the background color for the display. Customize Welcome Screen: The 3.1 release introduced the Modern Splash Screen which rotates through up to 6 customizable background images to help reduce the risk of burn-in. The modern splash screen shows connection instructions on the right half of the screen, and these instructions may be toggled on or off from the Dashboard. If you prefer the pre-3.1 splash screen, you may select the Classic Splash Screen option. Connection Instructions Overlay: You can choose to hide the connection instructions, show them, or create your own customized instructions to appear on the display’s Welcome Screen. When creating custom instructions, you can add up to 7 lines or 350 characters (supports both plain and rich text formats). You can add a dynamic IP address to your instructions by including the network name in brackets, e.g. [INTERNAL], and the string will be replaced with the corresponding IP address. Quick Connect Info: Solstice provides the option to show the fully qualified domain name (FQDN) or hostname instead of an IP address if set up through your DNS. If enabled, this provides a more streamlined connection experience for users that would otherwise be typing in an IP address, and allows admins to mask the IP address for security reasons without interrupting user workflow. Note that a change to the way the name is displayed may take up to 30 minutes to be reflected on the Solstice-enabled display. Provides the Dashboard user with control over which Client Sharing Options are available for users that connect, whether they may use Browser Look-in, Media Alignment Default, and any limits on number of posts or simultaneous connections needed to manage bandwidth. Client Sharing Options: Disabling any given client sharing option means the users in the room will not see that specific sharing option for the displays the option is disabled for. NOTE: The option to Enable AirPlay Discovery Proxy allows mirroring of iOS devices on networks that do not allow UDP broadcast/multicast traffic or Apple’s Bonjour protocol, but does not support video sharing on all networks. Refer to the Network Deployment Guide for more information. If enabling Miracast, see How to Deploy Miracast for more information on how configure other options to get Miracast working. Display Options: For Gen3 Pods only. Set the display options for when the Pod is connected to two display monitors. Media Alignment Default: The default media alignment mode can be set to Align to Grid, Freeform, or Determine at Runtime to let users in the room decide. Resource Restriction: Resource restrictions can be set to limit the number of connections, the number of posts, and the designated size that images will automatically be resized to. For Solstice Small Group Edition (SGE), the maximum number of connections (devices) is limited to four. Advanced Rendering can be enabled for Solstice Windows Software instances only and is a resource and performance trade off that requires a high-quality graphics card. For question about the setting, contact Mersive Customer Support. Client QuickConnection Action: Disabling auto-connect by selecting the Launch Client option means that users who enter the display’s IP address to access the Solstice client software will still need to connect to the Solstice display after the client software is downloaded (i.e. the client won’t connect to the display automatically). Accessibility: Provides options to improve the accessibility of the Solstice display. Enable the spoken screen key feature which will “speak” the four-digit screen key from the Solstice-enabled display’s audio output when a user attempts to connect. Requires screen key to be enabled (Security tab > Access Control section). Allows the administrator to configure the Solstice client application to launch either when the user logs in to Windows or when the client connects. It can also be configured to hide on last client disconnect. Deselect all launch options to disable all automatic launching or hiding of the client application. This is where the administrator can enable or disable users’ access to a designated video folder on the Solstice host PC. When this function is enabled, users can access and play video content in the designated folder from their client devices during Solstice sessions. Allows the admin to configure live video feeds. To enable a video feed, select the Capture Source Feature Enabled option and click Apply. A list of attached video sources will appear. If no video sources are found, this section will say “None”. Attached sources include those such as native web cams or external video feed from USB cameras. Use the list of attached video sources to enable and change settings for one or more video feed sources. Gen 2i Pods (updated to Solstice 3.3 or later) and Gen3 Pods may attach to Ethernet networks that require a specific certificate. When Enable 802.1x is selected in the Ethernet settings, new authentication settings will appear. Certificate upload options will change based on the EAP Method selected. For example, TLS requires both a CA certificate and User certificate, while PEAP just asks for the CA certificate. Supported certificate file types are .cer, .der, .crt, .pem, .pfx, and .p12. IMPORTANT NOTE: When configuring these settings, ensure there is network access between the Pod and the Windows machine running Dashboard. You must also ensure that the Pod has access to a timeserver so that it can validate the certificate. Additional configuration options appear once a wireless mode is selected. In WAP mode, a wireless network name (SSID) can be designated, as well as security options for users that want to connect to the Pod via the WAP. When the Pod is set to wirelessly attach to an existing network, options to scan and add wireless networks and input the network password appear. Lastly, the options to designate either DHCP or Static IP address appear again in this mode. Gen2i and Gen3 Pods expose the option to select the broadcast frequency (2.4GHz or 5GHz) and channel of the WAP. This allows admins to restrict the WAP to channels where the impact to the core networks can be minimized. Gen 2i Pods (updated to Solstice 3.3 or later) and Gen3 Pods may attach to Ethernet networks that require a specific certificate. When the wireless network is 802.1x authenticated, new authentication settings will appear. Certificate upload options will change based on the EAP Method selected. For example, TLS requires both a CA certificate and User certificate, while PEAP just asks for the CA certificate. Supported certificate file types are .cer, .der, .crt, .pem, .pfx, and .p12. Allows an administrator to specify the base ports over which Solstice traffic will be transported. Solstice will use the port defined in this field as well as the next two consecutive ports, plus port 80 for web configuration and client-server traffic. The communication ports used will be listed to the right of the Solstice Base Port field. Packet headers allow Solstice traffic to be differentiated and prioritized on the enterprise network by utilizing the IETF-defined quality of service (QoS) header information. For enterprise networks that support differentiated network traffic via QoS, enter 6-digit QoS video and audio stream DSCP strings in corresponding fields that appear below. Allows the administrator to designate how the Solstice display names are shared on the network and discovered by Solstice users. Options include Broadcast display name on the network via UDP broadcast/multicast traffic or List display to SDS which facilitates enterprise-compliant, non-UDP broadcast/multicast display discovery. The latter requires SDS to be installed and configured on a Windows PC connected to the network. For more information about SDS, refer to the SDS Guide. Provides a method to configure Solstice Pods and/or Software instances with a proxy server IP address for internet traffic access. This allows Solstice Pods deployed behind a secure Web Proxy to still reach the over-the-air (OTA) update server. The proxy server allows Solstice Software instances to be licensed and activated when deployed behind a secure proxy server. Both http and https options are available with web proxy IP address, port designation, and login credentials required for both. Use this option to point the Dashboard to the location of the local web server that software update files will be installed on and pushed out from using the Local OTA update method. For more information on this and other update options, see Options for Updating Solstice Pods to the Latest Software Version. Search tags denote logical groupings of Solstice displays, such as a location, building, or department. 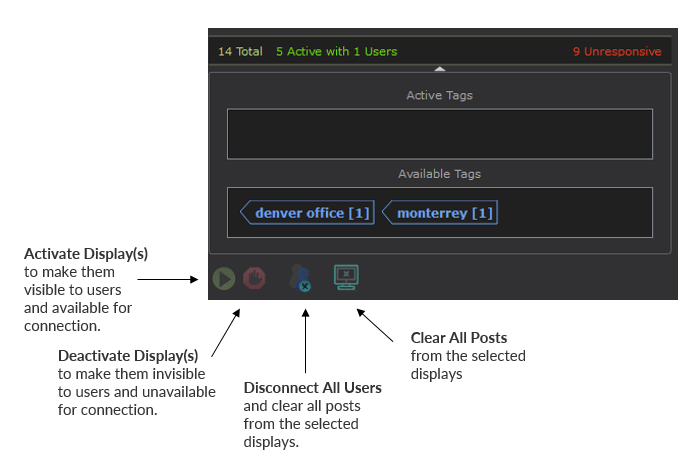 These tags can be created and applied to Solstice Enterprise Edition displays, allowing Solstice users to filter displays available for connection in their client discovery list by one or more tags. Admin Password: When set, users must enter the admin password in order to configure the display. If you wish to be able to configure Pods in-room or using a web browser when you do not have access to the Dashboard but want to ensure configurations are protected, set an admin password and enable the two “Allow configuration” options below. Enforce password validation rules: When checked, the password must contain a minimum of 8 characters, at least one uppercase and one lowercase character, and at least one number or special character. Allow Local Configuration: Allows users to configure Pods using the Pod’s local configuration panel (accessed by connecting USB mouse and keyboard to the Pod, clicking the Solstice icon, and navigating to the System menu). Leave this option disabled if you do not wish to be able to change a Pod’s configurations locally. Allow Browsers to Configure Pod : Allows users to configure Pods using the web configuration panel for the Solstice Pod (accessed by navigating to the Pod’s IP address via web browser, then going to the Settings menu). Leave this option disabled if you do not wish to be able to change a Pod’s configurations using the web configuration panel. Always serve the Solstice client via port 443: Use only on insecure networks where users may be subject to man-in-the-middle redirects. Selecting this option leads to additional clicks for the user to get started. Restrict Configuration Access on Guest Network: If a Pod is deployed in dual network mode, select this option if you do not want to give users on a guest network configuration access via web browser. You may define whether the wireless or wired network is considered the restricted “guest” network. Allows an admin to designate the user access/security mode which regulates how users connect to the Solstice display and which session types they may initiate. Start/Sync Multi-Room session enabled (Pod Only): Allows the Pod to initiate or join Multi-Room sessions. NOTE: The use of Solstice Multi-Room requires each participating Solstice display to have the screen key enabled. Screen key enabled (required for Solstice Multi-Room): Allows only those who can see the screen key on the Solstice display to connect to the session by entering the alphanumeric key. When the Browser Look-In feature is enabled for a display along with Screen Key, users will also be required to enter the screen key to access the browser view of the Solstice display. Screen key must also be enabled for the spoken screen key feature to function (Appearance and Usage tab > Accessibility). Moderator approval disabled: Prevents users from initiating a moderated session from their client. When moderator approval is enabled (i.e. when this option is not selected), the user can initiate a moderated session from their client device and become the session moderator, allowing them to approve or reject other users that attempt the join the session, allow additional users to moderate, and preview, accept, or reject non-moderator requests to share content. Encrypt Client/Server Communications: Allows for Solstice network traffic between the Pod or Windows Software host PC and user devices (clients) to be encrypted using a standard RSA/SHA cipher with a 2048-bit private key. The encryption feature includes network traffic related to remote configuration via the Solstice Dashboard and the Pod’s web-based configuration (when enabled). Note that when encryption is enabled for a display, that Solstice instance will no longer support connection from pre-2.5 versions of the Solstice client apps. Users will be required to update to Solstice clients version 2.5 or newer in order to connect. Certificate: Allows an admin to upload their own SSL certificate to prevent users from seeing an untrusted page warning when they attempt to access Pod-hosted webpages like the QuickConnect or Browser Look-in. Allows you to set the time format (12 and 24-hour formats available) and the system language. For Pods, you can choose to set the date and time manually or automatically from an Internet time server. You can also set the time zone and designate a machine Hostname. Download SDS: Provides a link to download Solstice Discovery Service (SDS) for enterprise-compliant display discovery as well as an option to reboot the Solstice Pod or Windows instances. Reboot: Provides a manual way to reboot a Solstice Pod. Restart: Provides a manual way to restart the software on a Solstice Pod. 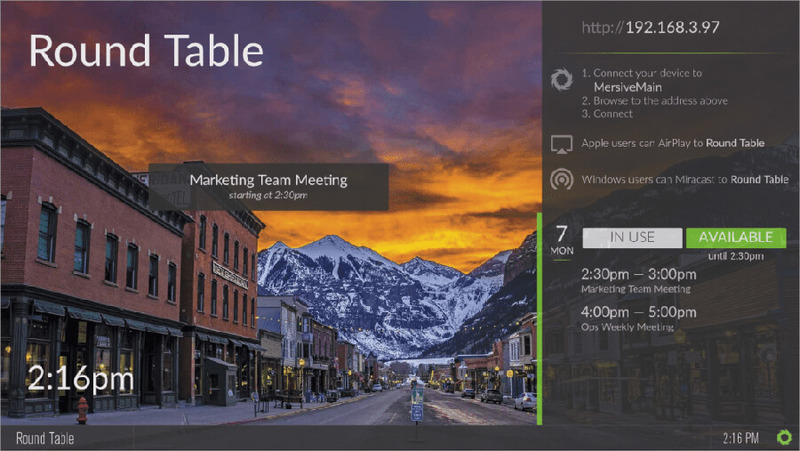 The Digital Signage feature was introduced in version 3.4 and gives the ability to show HTML-based signage on Solstice displays when they are not in active use for wireless collaboration. This configuration enables Solstice Pods to display HTML content from a source URL to get additional utility and value from Solstice between meetings. Full Screen: Signage content is displayed in full screen mode on the Solstice display. No Solstice connection information is shown, so users must know the Solstice display name in order to connect. Footer Only: Only the Solstice welcome screen footer is shown over the signage content. Users that are familiar with Solstice will be able to see the Solstice display name and/or IP address in the footer area in order to connect and share content (requires the source URL to be viewable within an iFrame). Footer + Overlay:The Solstice welcome screen footer and overlay instructions are shown on top of digital signage to provide users with full connection instructions and room calendar information if available. Mersive recommends deploying signage in Footer + Overlay mode for usability. However, not all URLs are supported in Footer and Footer + Overlay modes since source URLs must be viewable within an iFrame for these modes to work. For more information, see How to Configure and Use the Digital Signage Feature. Introduced with the 3.1 release, this tab allows an admin to connect Solstice displays to a Microsoft Exchange or Office 365 calendar, or open the display to receiving calendar information via the OpenControl API. If enabled, the attached display will show the next three meetings on the calendar and use that information to show “In Use” or “Available Until” statuses both on the display and in the user app’s display discovery panel. The Solstice calendar feature can be configured to support personal, delegation, or impersonation mailboxes and the administrator may choose to display the meeting title and organizer. The calendar updates at the same interval as the Exchange or Office 365 servers (about every 3 minutes), so the Test Connection button allows an admin to quickly troubleshoot a connection without waiting for the calendar to update on a display. To connect a calendar to one or more Solstice-enabled displays, select the target displays in Dashboard, enter the calendar credentials for your Exchange or Office 365 server and account, and test the connection before applying the changes. Note that you must supply the full server URL, such as https://mex06.emailsrvr.com/ews/exchange.asmx. Providing just the server URL without the full /ews/exchange.asmx path will result in an error. This Message Center was introduced with the Solstice Dashboard version 2.5 and includes the ability to share two distinct types of messages (Bulletin and Emergency Broadcast messages) from the Solstice Dashboard to any or all Solstice displays on the network. Provides lightweight digital signage functionality via the Solstice Dashboard and the Solstice displays on a network. This feature allows the Dashboard admin to designate lightweight bulletins that will be messaged across the top of any Solstice display the message is applied to when the Solstice display’s welcome screen is showing (i.e. when no content is shared to the display). Bulletin messages can be custom text-based messages inputted directly into the Dashboard Message Center, or RSS feeds by selecting the Add RSS URL button. Note that multiple RSS and custom message feeds can be added and enabled or disabled as desired. By default, Solstice Enterprise Edition endpoints come with a Mersive RSS feed enabled which refers end users and Solstice admins to a webpage for help getting started with Solstice (mersive.com/go). The Mersive product support phone number is also included in the default RSS feed. To disable the default RSS, simply deselect the Mersive RSS feed option. Emergency broadcast messaging will display an emergency message to any or all displays on a network regardless of whether the display is in use or not. Emergency broadcast messages will interrupt a Solstice session in progress and will display the emergency messaging on a bright red banner across the display. The feature’s default option is to apply the emergency message to all displays. However, that option can be deselected before posting the emergency message and a specific subset of displays can designated to receive the message. Kepler was introduced with version 3.4 and is a free cloud-based application that provides metrics and intuitive analytics on your meetings and monitors the health of your Solstice deployment. Capturing the data behind how your deployment is used provides key insights that allow you to adapt your meeting spaces to respond to workplace demands and improve the efficiency and utilization of those spaces. By monitoring your deployment, Kepler can alert you to any technical issues so they can be resolved before impacting meeting productivity, which contributes to a seamless and enjoyable experience for your end-users. Kepler requires your Pods to be Enterprise Edition with current Solstice Subscription. The Kepler tab can be used to create a Kepler account and onboard your Pods into Kepler to begin collecting data from the Pods and monitoring them in real-time. For more information, see How to Set Up Your Kepler Account. The Activity tab shows real-time usage information for all displays in the instances panel, including software version and platform information, number of users, number of posts, bandwidth usage, and live sources in use. Each column in the table is sortable. This tab presents licensing information for all displays in the instances panel, including status, display name, software version, platform information, Solstice Subscription expiration date, and additional device information including display name, device ID, Ethernet Mac Address, Wireless Mac Address, and/or fulfillment ID. Use web server for upgrades (default): Select the web server option if you wish to use a web server to conduct over-the-air (OTA) updates utilizing either the Mersive web server (default) or a local web server (requires configuration) to receive software updates from. This is the preferred and easiest method, as updates will be received from the designated web server and pushed out remotely to the Pods. Use local file for upgrades: Select the local file option if you wish to upload the Solstice Local Release (SLR) files into the Dashboard to have it push the upgrade to eligible displays. This method should be used when displays do not have internet access and are behind a firewall. For more information on the various upgrade methods for Pods and how to implement them, see Options for Updating Solstice Pods to the Latest Software Version. The Check for Updates button allows the administrator to check for available software updates. Once the check is run, the text immediately beneath the button provides a summary of versions and updates available for all the displays on the list, including a link to the release notes for the newest software version. Install Update: Allows an administrator to select one or multiple display hosts and install software updates. For Solstice Windows Software instances, this button links to the Download Center where the software update can be downloaded. Once downloaded, it must then be installed on the in-room Solstice Windows Software host PCs. Activate License: Allows an administrator to push a Solstice license to host PC by entering an activation key (Solstice Windows Software only). Recall License: Recall licenses that are install on host PCs to use on a different host PC later (Solstice Windows Software only). Rollback Version: Rollback selected Pods to the previously installed version of the Solstice software (Pods only). This will also reset configurations to how they were when on the previous software version. For example, if a Pod is named “Pikes Peak” while on version 2.8, then is updated to version 3.0.1 and renamed “Evans”, clicking the Rollback button would revert the Pod to both 2.8 software and the name “Pikes Peak”. Important note: The 3.1 software update for Gen2i Pods requires a change to the OS image that prevents rolling back from 3.1 to previous versions. When a new version of the Solstice Dashboard is available, the Licensing tab will provide a notification message and download link for the newest version of the Dashboard. Additionally, if a Dashboard admin attempts to upgrade one or more Pods to a software version that will make the Pods unsupported and therefore unable to be managed with their current Dashboard version, a warning dialogue will be displayed before the update is applied prompting the admin to update the Dashboard software first. The SDS tab shows options for Solstice Discovery Service (SDS), which provides an IT-friendly mechanism for display discovery (i.e. click-to-connect capability) throughout an enterprise. SDS is a free software program that runs in tandem with Solstice Pods and Windows Software hosts on the network. See the SDS Guide for more details about how to set up and configure SDS. Use only the Solstice Dashboard to manage your Solstice instances. This prevents changes from being made by users in the room with your Solstice wireless displays. You can prevent users from making in-rom changing by disabling the Allow Local Configuration option for all Solstice instances in the Security tab of the Dashboard and disabling the Allow Browsers to Configure Pod option for all Pod instances. This disables the local and web-based Solstice configuration panels, which are otherwise accessible via the Pod, host PC, or web browser. However, if you wish you to be able to access these configuration panels when you are in the room and do not have the Dashboard handy, you can keep these options enabled and choose to only password protect the ability to configure settings instead. You can access the local Solstice configuration panel by plugging in a USB mouse and keyboard, clicking the Solstice icon in the lower right of the display, then selecting System > Configure. 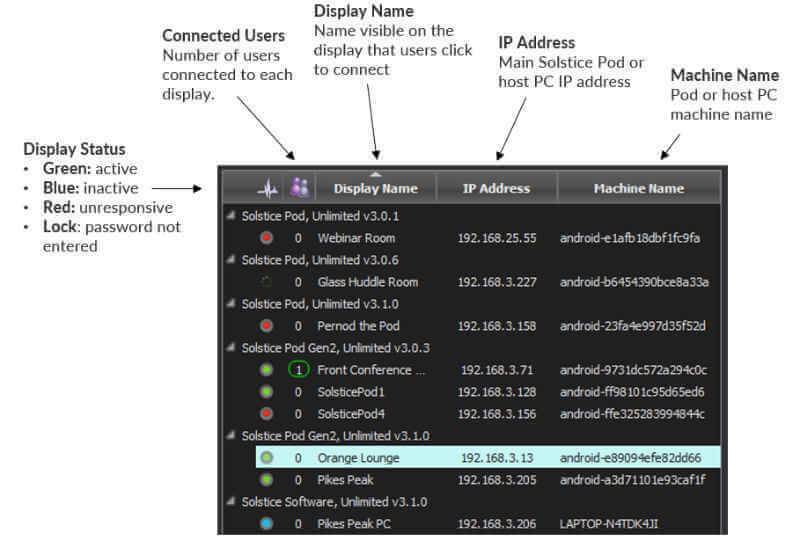 To access the web configuration panel for any Solstice Pod, enter the Pod’s IP address into the web browser of any network-connected device, then select Configure from the bottom left corner of the browser page. Password protect the ability to change configuration options for all your Solstice displays. To do this, select all of your displays in the Dashboard and then set the Admin Password in the Security tab and click Apply. Remember that if you have multiple instance groups, you will have to apply the change to each group. Once applied, anytime the Dashboard is opened, you will be required to enter the password in order to change any configuration settings. It is also highly recommended that you set the same administrator password for all your Solstice instances. This password will also be required to retrieve usage logs from your Pod or to perform a factory reset. Configure your broadcast and discovery settings for networks that don’t allow broadcast traffic. If your corporate or campus network does not allow broadcast/multicast traffic, turn off Solstice broadcast discovery by disabling the Broadcast display name on network option (Network tab > Display Discovery section). 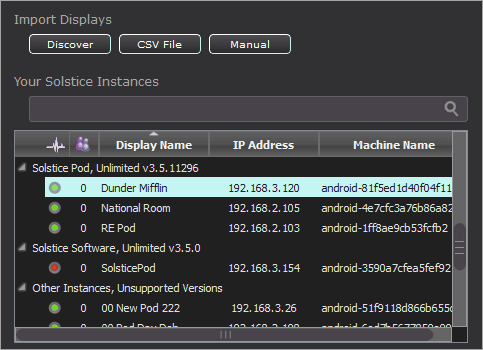 Make sure List display to Solstice Discovery Service remains enabled if you are using SDS as a broadcast alternative. To enable iOS users to mirror to the Solstice Display(s) via AirPlay when broadcast traffic is prohibited, select Enable AirPlay Discovery Proxy in the Usage and Feature Management section of the Appearance and Usage tab.